Western Oregon homeowners with boxwood shrubs should keep their eyes peeled in early spring for signs of a disease that’s been making gradual headway in the state. Boxwood blight first showed up in nurseries in Oregon in 2011, and has continued to make inroads in the Portland area, according to Jay W. Pscheidt, a plant pathology specialist with Oregon State University’s Extension Service. “The message to homeowners is that if they notice something unusual going on with their boxwood they’ve never seen before, it could be boxwood blight,” Pscheidt said. 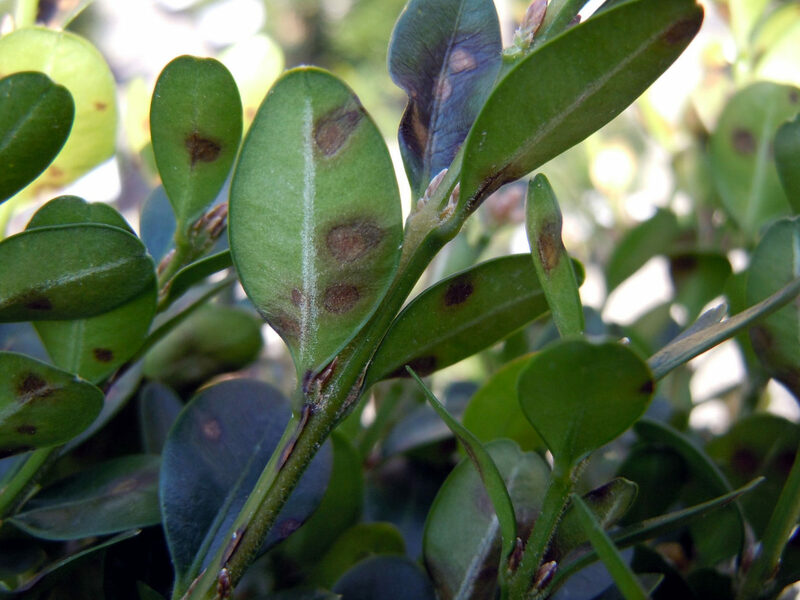 Boxwood blight (Calonectria pseudonaviculata) causes spots on leaves and stems and eventually defoliates and kills the plants. Stem lesions show up as wide black streaks; on leaves they appear as round spots. The fungus is active during warm, wet weather, splashing from plant to plant by rain. Even during a relatively dry spring, the disease can still spread because overhead watering can cause the same conditions that allow the disease to thrive. The sticky fungal spores easily attach to clothing, pruners or other equipment and then transfer to other boxwoods. There is no cure, but preventive measures can help keep the disease from spreading. The most effective method is to inspect purchased plants and keep them in an area away from already planted boxwood for two weeks or more. If the shrubs don’t show spots, they can be planted. Boxwood blight emerged in Europe in the early 1990s and quickly spread. Eradication efforts have been unsuccessful. The fungus most likely made its way to North America by hitching a ride on plants shipped from Europe. By 2011, the disease had been found in nurseries and landscapes in several East Coast states, three nurseries in Oregon and four in British Columbia, Canada. According to Pscheidt, wholesale nurseries in Oregon, which consider boxwood a bread and butter crop, have kept the disease mostly in check with a nursery cleanliness program administered through the Oregon Department of Agriculture. But the disease has jumped into some landscapes in Portland and Coos Bay. Now that it’s made inroads into gardens, cooperation from homeowners is essential. Inspect new plants and isolate them from other boxwoods for at least two weeks before planting. Avoid overhead watering. Instead, use a soaker hose. Don’t work with wet boxwood. Disinfect pruners and hedge clippers after use. If you have a diseased plant, place it in a plastic bag and dispose of it in the garbage bin rather than yard debris recycling bin. For more information, read about boxwood blight in Extension’s Pacific Northwest Plant Disease Management Handbook or contact an OSU Extension Master Gardener. Kym Pokorny is a garden writer with more than 20 years of experience writing for The Oregonian and other publications. She is currently a communications specialist with Oregon State University Extension Service. Kym can be reached at kym.pokorny@oregonstate.edu. The Home Orchard Society Hosts the 44th annual Fruit Propagation Fair! Copyright © 2019 Oregon Association of Nurseries All Rights Reserved. Don't miss out on events, classes or any of our Plant Something inspiration. Follow us.